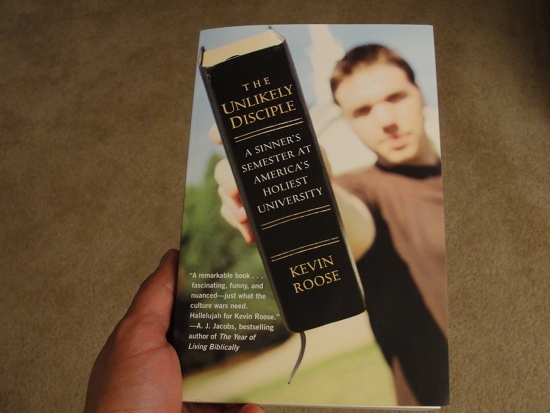 One of the best books I read last year was Kevin Roose‘s The Unlikely Disciple: A Sinner’s Semester at America’s Holiest University. 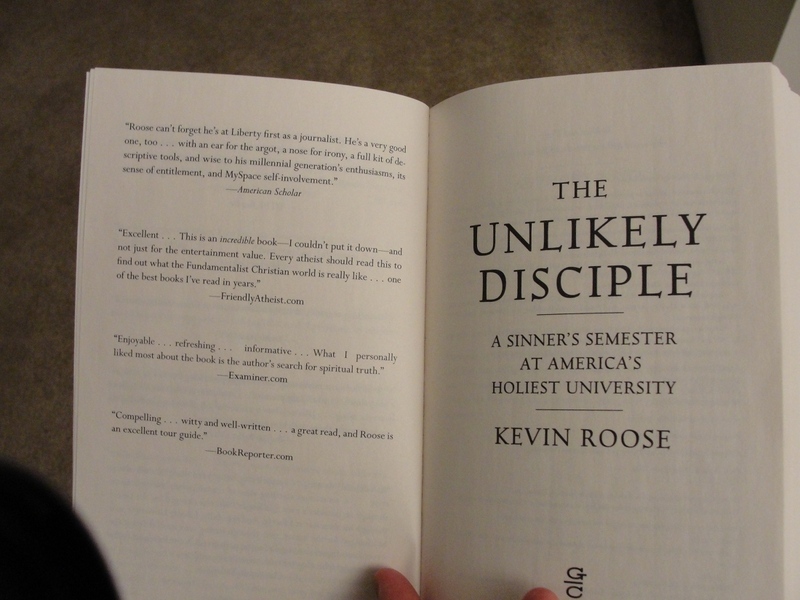 It’s the story of an Ivy League student who spends a semester at Jerry Falwell‘s ultra-Christian Liberty University. My review and interview with Kevin can be found here. Let that be a lesson to all of you: If you spend a semester at a super-religious school, live to tell about it, and write an awesome book, I’ll say good things about it. So, get applying and begin the process. Register for the 2010 Secular Student Alliance Conference! I’ll add this to my current reading list which is 20 books long right now. Put in a request for purchase to the local library. Random thought: Is it just me or is this the sort of book that’s likely to land an interview on The Colbert Report? It’s the perfect kind of material to start a satirical argument over for Colbert. Sorry, even a good blurb from Hemant isn’t worth spending a semester in a living hell. I had been looking at that at the book store. Hmmm….I wonder if the library has it. Warning: reading this book may actually cause you to view Christians as human beings. Proceed with caution. Is this a serious offer? How about not just a semester, but three years? Please read this. I loved that book! I read it when you discussed it way back when the book came out in hardback. It was delightful. Great, now I’ve two books that I really have to get — this and yours that I’ve yet to read but want to. . . .When I was young I was alone in my rejection of xianity. I spent 18 years among monsters of xian hatred — with parents and schoolmates viewing me with varying degrees of unsympathetic incomprehension mingled with overt hostility. In Ameristan with whom are you going to share the delicious humor in the second essay of ‘On the genealogy of morals’? Nietzsche became my guide. And, I learned to out-argue all apologists of the big-3 monster-theisms by learning philosophy, logic, the history and philosophy of science. But Saul, ever the anti-intellectual hate driven proclaimer of the latest hellenistic savior-god, gave to struggling jewish xianity its core gift, a perverse inverted snobbery. The inverted snobbery of poor, ignorant, envious, malcontents — those living in the lowest strata of Imperial Rome — God is these scum writ large:We stink, but stinking is godly. God chose “the things that are not — to nullify the things that are…” Here pure xian nihilism gets injected into the marrow of western culture, poisoning it down to today. I should have added it before, but now this book is on my list to get. Nice mention in the credits. anti_supernaturalist, could you please tell us all why you are?